Hello my lovelies! How was your weekend? Today's post is coming later than usual because I had to get some rest after I got home from work today. I had an amazing weekend because I went to see the Robbie Williams concert in Bucharest. It was fun, but I'm still a bit tired from the road. Nothing that a little more sleep can't solve. In other news, my nails are doing really bad these days so I had to shorten them even more. I did prepare some manicures in advance though, so there's nothing to worry about. The one I'm showing you today features some very cool shades of blue. Depending on your monitor settings this might look grey but it's actually more of a steel blue color scheme. The base is a light steel blue creme from Essence called Sure Azure. This is an older Essence polish so it's definitely not available anymore because it came in the old and round Colour & Go bottle. It's an interesting color though and I haven't used it in ages. Sometimes it's fun to rediscover shades like this one. 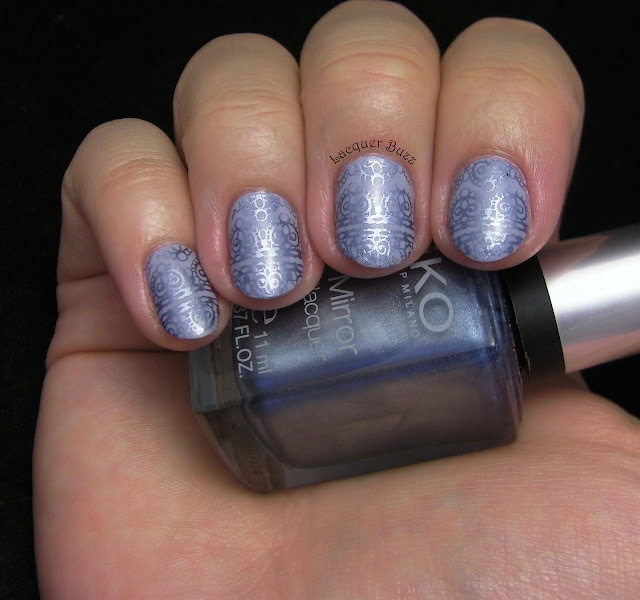 The polish I've stamped with is Kiko 623 Blue from the Mirror collection. It's a silvery blue foil that stamps like a dream. This collection isn't available anymore either but I'm sure there are similar metallics and foils out there for your stamping needs. I've used an image from plate BP-L020 from the Born Pretty Store. This plate is full of intricate patterns and I chose one that resembles a beautiful arabesque. I always like to think that this look is sort of a signature look for me. Subtle stamping using a metallic polish over a similar creme base is what I like to do most. I absolutely love the result and I hope you do too. Don't forget to check out the rest of the Monday Blues of July in the links below! in love with this combo!